The Balanced Boater: "The Catch"
But for Sea Paddlers of all persuasions there is another "catch": namely that a constant well modulated forward stroke will sometimes waste vast amounts of precious wave energy. Moderate sea and wind conditions will favour the paddler who is able to change the timing and placement of strokes to harness this power. 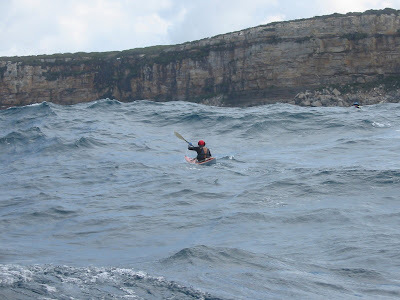 The most dramatic example of open water wave-riding can be seen in ocean races when ski paddlers pick up long exhilarating runs (e.g The Molokai), but I need to look no further than some of my regular ocean paddles along the Sydney coast to see the importance of developing these skills. The speed difference between various members of my Tuesday Night Group is nowhere near as obvious on flat water as it is in moderate sea conditions and, even more striking, is that some of the quickest flat water paddlers aren't the quickest rough water paddlers. So what makes a good wave runner? There are the obvious things like stroke. The same qualities that make a good flat water paddler are essential in a sea kayaker. Then there is confidence, familiarity, and balance. But these alone don't explain why two otherwise well matched paddlers will sometimes travel at such dramatically different speeds on the sea. The special ingredient is developing a feel for just where and when to place the blade and position your kayak to capture maximum power from the wave. Below are some tips for developing this feel and extracting more performance from your sea kayak. This is a steep locally generated wave pattern from astern that is travelling faster than you can cruise but is still slow enough to catch. You can also use local sea waves to generate enough speed to catch the bigger, faster moving swells. If the swell and sea are running the same direction then this is about speed and timing. When the sea and swell are running in different directions this requires catching a series of rides down wave and then having the knack 0f "tacking" onto the running direction of the swell. Then there is riding sea waves against the swell direction. This happens around Sydney quite a lot particularly in Summer when the afternoon NE sea breeze often provides a fast ride directly into the SE swell. Even more surprising is just how much speed you can gain by varying your cadence to accelerate "downhill" on the backs of oncoming wind waves (sea). By far the most unappreciated source of helpful energy can be found in rebounding seas along steep shores and cliff lines. With good timing and a trained eye for finding the underlying wave patterns hidden in the apparent chaos a fast 'slalom' ride is often available. Your cadence may need to be syncopated to pick up this funky ride!. The unfortunate fact is that sea kayakers are the "plodders" of the paddling world. We generally paddle wide, heavy boats long distances at fairly low speeds and many of us don't even attempt to chase the exciting free rides that are there for the taking. The more you chase waves the faster you will get and the more waves you will catch. Try to do a few sprints every time you paddle and teach your body to perform a technically sound stroke at a higher rate with a light and lively grip on the paddle. If the budget will stretch to a workout boat (e.g a ski or racing kayak) then a regular session in this may help. The sea will often consistently broach you in the same direction and, if it is steep, it may frustrate even the most committed rudder user. (After all, the rudder will often be in the air!) To maximise rides you need to be able to use your edges to counteract the broach. You need to be able to take off on a wave with the boat on one edge. Constant trailing braces or leaning on a stern rudder may make you feel more secure but they are akin to putting on the brakes. The more you keep braking the more you will broach and lose directional control and position for the next wave. In years of working as a sea instructor I have seen many more unintended capsizes due to loss of directional control and uncontrolled broaching than I have seen due to general instability. In following seas make your course changes on wave crests, with a little sweep and edge blended into your forward stroke. Be more aggressive, make small course corrections often, and cutback on strokes which drag your paddle and slow you down. Some boats are "trim sensitive" and will run faster down wave with your weight forward. The usual trade-off is looser tracking, so its worth experimenting with when to shift your weight back to engage the stern and hold your line, or when to lean forward to accelerate. Next time a racing ski paddler leaves you in their wake remember that they are relying on their forward stroke to steady their boat. Rather than trailing a blade they keep looking for stable water to catch with their blade. Regardless of the challenges to balance that happen between strokes a solid catch is not only for power it is also the first line of defence. If in doubt keep paddling!. 6) Finally: Remain Aware of The Possibilities. Many new paddlers dread following seas and the slippery stability the sea imparts on their boats. But following seas are not just a fact of life, they are also one of the great pleasures of sea kayaking. There is nothing quite like the buzz of sliding down the face of a steep wave with the hull humming and plumes of spray flying off the bow.That is the best reason I can think of to develop skills and a feel for the waves. That's all well and good, but I still can't paddle my turtle in a straight line. I think kogvos is a menace. He sounds strangely familiar, with incarnations from previous lives online reading through his overall tone & phraseology. Could kogvos really be ..........? Mark Sundin? Who is this Mark Sundin. You make a bold call, my friend. Be warned, your goat will be hollowed out and paddled verociously off the Nadgee wilderness lest you cease these spurious claims.